Of Newark's many religious buildings, few are as grand, and few have seen as much history as the tan brick building with a green dome at the southern end of Martin Luther King Boulevard - the present Hopewell Baptist Church and former Congregation B'Nai Jeshurun. Before I say anything else, I would like to apologize for not giving equal amounts of information on B'nai Jeshurun and the Hopewell Baptist Church. This differential is the product of the amount written about each congregation. Since B'nai Jeshurun was, among synagogues, definitely the oldest, probably the wealthiest, and one of the largest, I have been able to find copious amounts of information on it. While the Hopewell Baptist Church is one of Newark's most important churches, it is not quite of equivalent prominence. There are records of scattered Jews living in Newark in colonial times and the early Nineteenth century, but these Jews seem not to have formed any community associations or left any mark on Newark. The real founders of the Newark Jewish community were handful of German Jews living around Arlington Street in the 1840s. These Jews by and large came from small cities and farming communities in central Europe, not Berlin or Frankfurt. Contrary to what one would expect based on their later history, these German Jews were also Orthodox. In 1847 the Jews of the near west side began to have a minyan (a quorum for worship services) in the attic of Isaac S. Cohen on Washington Street. The services were humble, the congregation's only Torah scroll being the personal property of Cohen. When B'nai Jeshurun incorporated in 1848 it was the first synagogue in Newark and the second in New Jersey, another group in Paterson having incorporated in 1847 with the same name, "B'nai Jeshurun." The name "B'nai Jeshurun" means "Children of the Upright." For its first ten years the growing congregation went from rented space to rented space. From the beginning, synagogue members wanted something permanent, but the congregation was simply too poor to afford anything until 1858, when a small, barely 15' wide building was wedged in between two other buildings at Academy and Washington Streets. Early on the synagogue formed non-worship women's and men's groups, most with German titles. In the 1850s the synagogue had a Daniel Webster Society. This group once had a debate, "Should slavery be abolished?" Contrary to what is popularly said of this congregation, B'nai Jeshurun did not immediately abandon Orthodoxy. The 1858 synagogue was still Orthodox, it had a mikveh (ritual bath) and members were required to buy meat from a kosher butcher and refrain from work on the Sabbath. As late as 1864 the majority of the congregation's board rejected a Reform prayer book. Education was extremely important to the members of B'nai Jeshurun. As early as 1850 the more erudite members of the Congregation were offering religious instruction. In 1863 B'nai Jeshurun founded its own Jewish day school. As B'nai Jeshurun was still Orthodox in those days, Jewish education was emphasized over secular education. 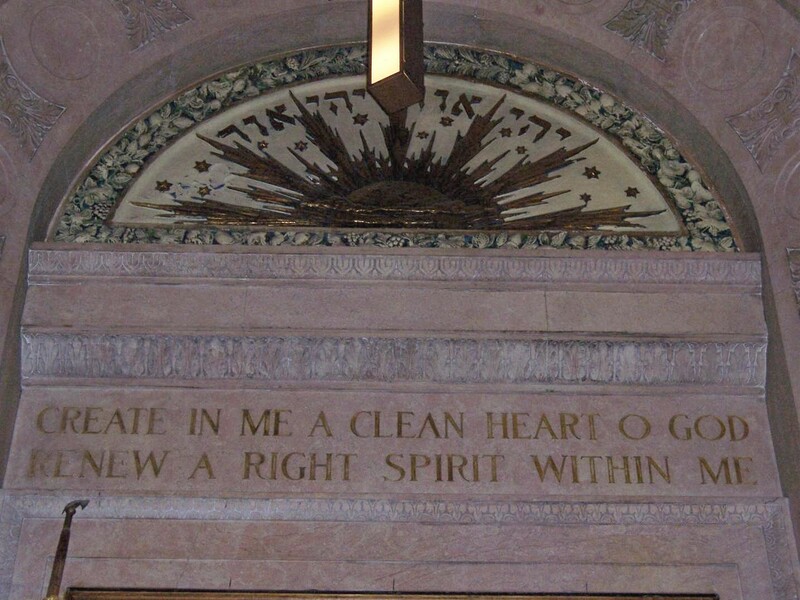 Even before the 1858 structure was completed the leaders of B'nai Jeshurun realized that it was inadequate to meet the future growth of the congregation. By the Civil War B'nai Jeshurun was large enough, and its members affluent enough, to build yet another synagogue, this one to be a work of great architecture. The Moorish 1868 synagogue had a copper dome and two flanking towers. The towers themselves cost one-third of the entire structure's budget. The fact this group was able to build so fine a building after less than twenty years of residence in Newark is testament to the great economic opportunities in Newark in the Nineteenth century and the talents and hard-work of these individuals. If one were to judge solely by economic success and success in being socially accepted, these men and women had found their own promised land, a sentiment expressed in the lunette of the Torah ark in B'nai Jeshurun. The Hebrew inscription concerns finding Zion, but the map itself shows North America. Congregants ceased to pray in exactly the same way that their forefathers did in the 1860s, under the leadership of Rabbi Joseph Leucht. In 1869 tallit (prayer shawls) were banned, in 1882 so were yamulkes. In 1871 the observance of the second day of festivals was done away with. Women and men were allowed to sit together. Rabbi Leucht began to preach in English. While I have been referring to B'nai Jeshurun's spiritual leaders as "rabbis," these men actually used the title "reverend." 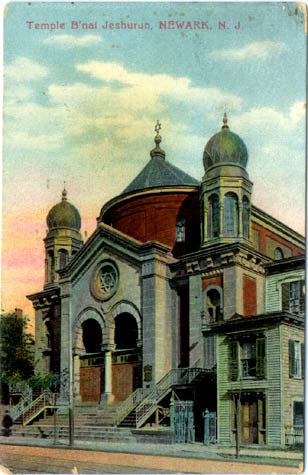 1881/2 B'nai Jeshurun became the first synagogue in New Jersey to affiliate with the Union of American Hebrew Congregations, aka, the Reform movement. Most of the reforms that B'nai Jeshurun made were justified by a desire to Americanize. The wearing of yamulkes was considered an "oriental" custom that was unfit for America. Rhetorically, the congregation asked, "would you wear a hat in the house of a friend, and is not the synagogue like a friend's house?" Perhaps most significantly, B'nai Jeshurun closed its Jewish day school in 1869, replacing it with an afternoon school. The issue was not cost, but again the desire to be American than Jewish. Philosophically, Rabbi Leucht opposed all parochial schools. The vision of B'nai Jeshurun was of an American, Reform Judaism. B'nai Jeshurun was, and is, highly ecumenical. Christian clergymen were invited to speak from B'nai Jeshurun's pulpit and B'nai Jeshurun's rabbis were as learned in secular affairs as they were in Jewish affairs. The First Baptist Church worshipped in B'nai Jeshurun's sanctuary during the construction of what was to become the Peddie Church . Newark's Jewish population soared during the course of the Nineteenth and early Twentieth centuries. B'nai Jeshurun made a few expansions to its 1868 building, but by the 1910s B'nai Jeshurun needed to move once again, this time a site was chosen on then-wealthy High Street, near to the center of Newark's Jewish community. B'nai Jeshurun's neighbors included the High Street Presbyterian Church, Beth Israel hospital, the Krueger Mansion, B'nai Abraham (which later moved to Clinton Avenue) and Congregation Oheb Shalom. A few years later B'nai Jeshurun would be joined by another major Jewish institution, the YMHA. The leaders of B'nai Jeshurun chose the New York City architect Albert S. Gottlieb to design their new home. The site had been owned by someone with the last name Jackson. Construction took place from 1911 to 1914. Gottlieb's other designs include the Greenville Branch in Jersey City and a few apartment buildings in Manhattan. Again, the Reform characteristics of the congregation were reflected in its architecture. The sanctuary faced west, so worshippers had their backs to Jerusalem. 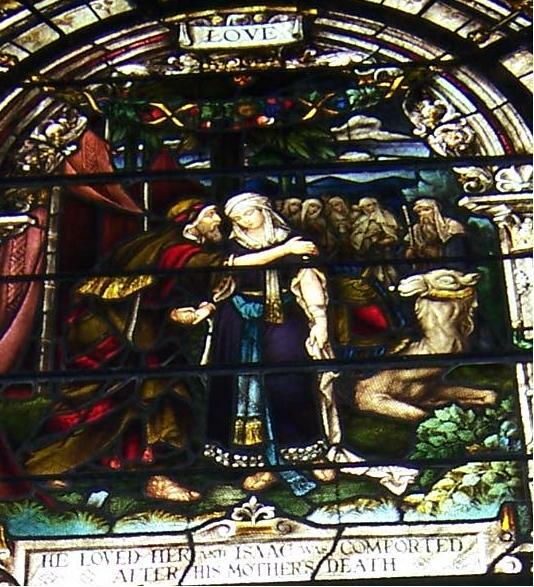 There was an organ, stained glass, and no separation between men and women. this is the greatest house of worship in the city. You have outdone us all. We expect from you the reaching out of a hand that is strong. May G'd bless you. But what a synagogue it was. Eventually extending the whole block back to Quitman Street, the synagogue had more than enough room for a grand sanctuary, a library, a secondary auditorium with a stage, and religious school space. 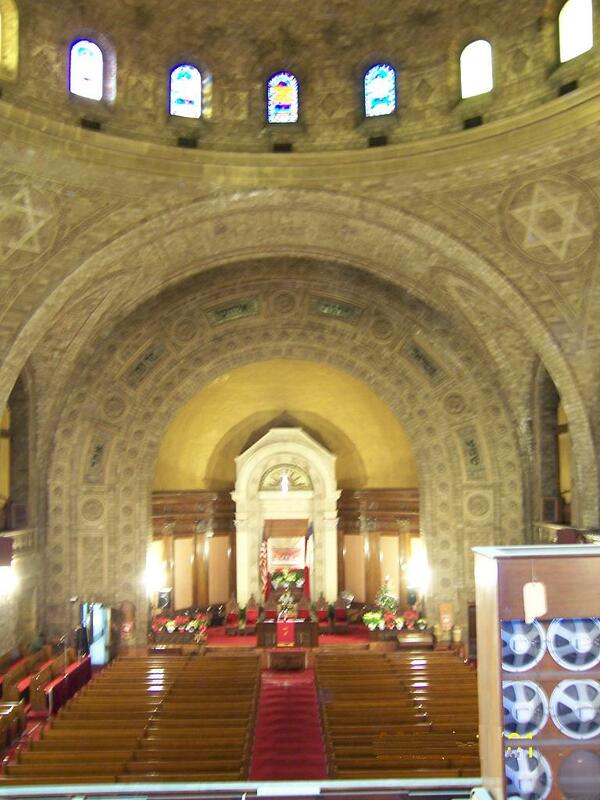 The main sanctuary of B'nai Jeshurun has a 100' dome covered with specially made acoustic Gaustovino tiles. The area behind the marble torah ark is gilded, as are some of the many menorahs to be seen. The (once gilded) Hebrew insciption on the wall around the stage is "Sh'ma Yisrael Adonai Elohenu Adonai Echad," "Hear O Israel, the Lord is our G-d, the Lord is One." The early Twentieth century was the golden age of Newark Jewry. B'nai Jeshurun members included some of Newark's leading Jewish citizens, such as the Plaut brothers, Louis Bamberger, and Felix Fuld. (Bamberger and Fuld seem not to have been major financial backers). Though B'nai Jeshurun had been founded by German Jews, after 1900 most members were of Russian/Polish Jewish extraction. In light of the demographic changes Newark was undergoing in the 1940s, 1950s, and 1960s it is not surprising that B'nai Jeshurun would eventually leave the city in 1968. What is surprising that the final move would take so long. By the 1940s B'nai Jeshurun's leaders noticed that a large fraction of its young families with children lived in the suburbs. In 1952 the synagogue opened a satellite location in a large house South Orange at Center street. Hebrew school classes and Sabbath evening services were held at the South Orange location, with Newark being reserved for the High Holidays at Sabbath mornings. In the early 1960s B'nai Jeshurun bought land in Short Hills from the Kean estate. Rabbi Pilchik called the Newark neighborhood the "worst neighborhood in the country" so there was some urgency in the move. By the late 1960s the old High Street Building - by this time Martin Luther King Boulevard - was only used for the High Holidays. In 1966 the cornerstone for the Short Hills building was laid. 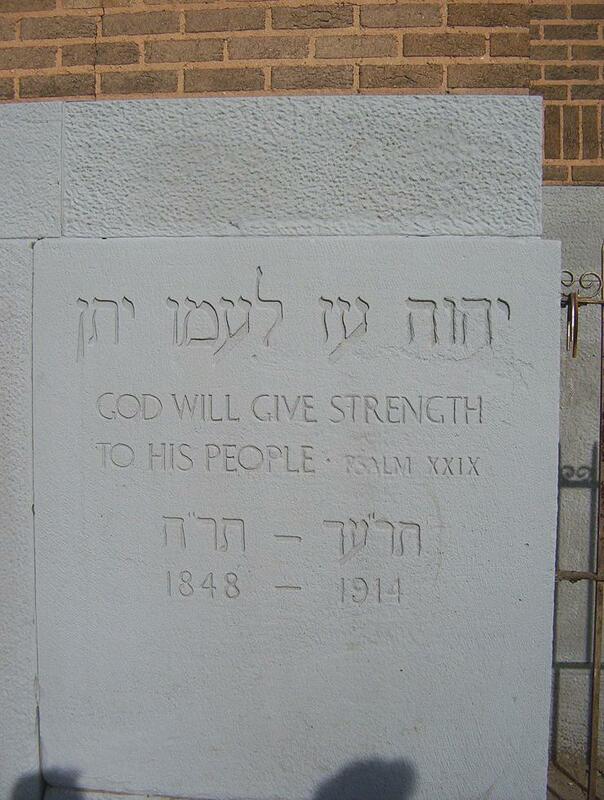 In late 1968 B'nai Jeshurun unscrewed the honorary plaques from the Newark building (many of which dated back to the 1868 structure) and reinstalled them in Short Hills. B'nai Jeshurun also moved its Newark Eternal Flame - called a Ner Tamid - and reinstalled that in Short Hills. Finally it moved its torahs. In September 1968, in time for the High Holidays, the Short Hills sanctuary was dedicated and, after 120 years, B'nai Jeshurun officially left Newark. In 1916, the year after B'nai Jeshurun moved into a new building on High Street, a small group of African-Americans around the Burks family formed a new Baptist church. They would call their church "Hopewell" after a desire to "hope well." Like B'nai Jeshurun in the 1840s, this tiny group spent its first few years moving around from rented site to rented sight - a storefront here, an attic there. The Burks family happened to be from Georgia, but the membership really drew from all over the Southern United States. Newark's black population grew considerably in the middle decades of the Twentieth century, as did the Hopewell Baptist Church. Eventually the Hopewell Baptist Church found a permanent home at the intersection of Clinton and Avon Avenues, where there are now housing projects. While the Hopewell Church was not quite as prominent among black churches as B'nai Jeshurun among was among synagogues, the Hopewell Baptist Church was one of Newark's largest and economically comfortable churches, numbering among its members many professionals and entrepreneurs. The leadership of the Hopewell Baptist Church was at the forefront of the Civil Rights movement in Newark. Hopewell's minister in the 1960s, Dr. Boyd Cantwell, was president of the Newark chapter of the NAACP. While Cantwell was a vocal activist against racism in the Newark government, he was not a radical, and urged "to keep it cool" during the 1967 riots. Since 1991 the pastor of the Hopewell Baptist Church has been Dr. Jason C. Guice (rhymes with "ice"). Hopewell's Minister of Music is Joshua Nelson, an African-American observant Jew. Nelson, a "the prince of kosher gospel," has performed for both Jewish and black audiences all over the globe. In 2004, rabbis and cantors from B'nai Jeshurun in Short Hills had a kind of homecoming in Newark. The Hopewell Baptist Church is just as ecumenical as B'nai Jeshurun was, and Hopewell has hosted Newark's official Holocaust Rememberance day. It was for a Holocaust Rememberance day that the clergy of B'nai Jeshurun was reunited with their old home.